"High-protein side dish with plenty of flavor and crunch. Rinsing the quinoa three times will help to eliminate any bitterness." Combine quinoa, cold water, and salt in a saucepan; bring to a boil, reduce heat to medium-low, place a cover on the saucepan, and cook until the liquid is fully absorbed, about 15 minutes. Heat olive oil in a skillet over medium heat. Cook and stir celery, onion, carrot, and garlic in the hot oil until the onion is translucent, 5 to 7 minutes. Stir almonds, tomato, raisins, salt, pepper, thyme, and oregano into the vegetable mixture; cook and stir 1 minute more. Fluff the quinoa with a fork and stir into the mixture in the skillet; cook and stir until evenly mixed and hot, about 30 seconds. Divide between 3 plates; sprinkle the top of each portion with a scattering of a few coarse sea salt granules for a surprising crunch of salty goodness. 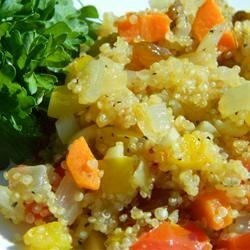 Try Sprouted Quinoa Savory Pilaf for an easy and delicious side dish. I thought this was pretty good. This recipe was delicious! The only substitution I did was to use dried cranberries in place of raisins, because that's what I had in the pantry. Definitely a keeper! This recipe was so delicious! My husband, who has disliked every quinoa recipe I've ever tried, went back for seconds and was sad that there were no leftovers! Looking forward to making it again. I make this all the time and use it to introduce quinoa to people who have never tried it before. Everyone likes it and I get lost of requests for the recipe.